As consumer technology advances, feature sizes on focal plane arrays are getting smaller. As a result, indium bump electroplating is becoming a less effective fabrication technique. A better solution, providing good lift-off yield, high shear strength and collimated physical vapor deposition (PVD) is available with indium bump deposition. Collimation control provides optimized lift-off for more productive yields by eliminating edge effect and minimizing lift-off issues. When shear strength between wafers is low, small shear strain puts bumps at a higher risk of tearing. Poor crystal structure is the primary cause of poor shear strength, and poor crystal structure itself has two causes: geometry and temperature. In the case of geometry, crystal structure is impacted by an imprecise angle of incidence during indium deposition, which leads to poor indium fill. This problem can be averted when the indium source offers collimation control, which creates a 7° maximum deviation from the direct line of sight, ensuring direct deposition. This collimation control also enables high yield lift-off. In the case of temperature, crystal structure is impacted when the substrate stage is too warm for indium’s low melting point (156.6°C). A excellent solution for this challenge is offered by Denton Vacuum’s Integrity Indium Coating solution: a lower-temperature (super-cooled) substrate fixture that is well suited to textured films and small grains, ensuring good crystal structure and higher shear strength. Denton Vacuum’s consistent and repeatable solutions for indium bump offer collimated control and a cooled substrate stage for maximum yield. View our product offerings below for more information. 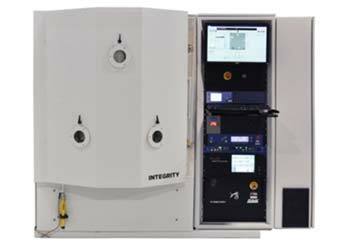 The Integrity is configured for demanding optical coating, semiconductor and compound semiconductor applications. A temperature management system supports a fluid-cooled substrate stage for small grains and textured films.